A card logic game set in the fantasy universe of Azeroth, known from the Warcraft franchise. The game was developed by Blizzard Entertainment company, who mention the cult card game Magic: The Gathering as one of their major inspirations. Hearthstone: Heroes of Warcraft for PC, AND and iOS is a logical card game. It is based on free-to-play model with micro-payments system. The main element of the game is play against other people using the Battle.net service. 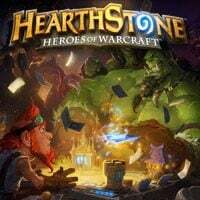 Hearthstone: Heroes of Warcraft was developed by a small team of 15 people at Blizzard Entertainment, creators of many great game series such as Diablo, StarCraft, Warcraft, and World of Warcraft. The rules are similar to those known from other card games such as, for example, Magic: The Gathering. The background is based on the world of Azeroth in which the series of Warcraft and World of Warcraft are set. The players choose one of nine character classes available in this universe, and then, one by one, play cards from their deck which results in casting spells, using special weapons or abilities, or summoning allies. The basics are easy to learn and the player does not have to be an expert who knows the ins and outs of both the Warcraft universe as well as other card games. There are also training battles available in which the opponents are the strategists from the world of Azeroth such as Thrall, Uther, or Gul'dan. Apart from training, there are another two game modes designed for competition with other players. These modes are “Duel”, where players participate in ranked and non-ranked games, and Arena which requires an entrance fee. The player receives packages of cards, every one of which contains five random cards divided into five classes: normal (white), rare (blue), epic (purple), or legendary (orange). Each package consists of at least one or more rare card(s) and each of them can also be improved to gold version. Packages can be earned by winning battles or bought for real money. Graphic design in Hearthstone: Heroes of Warcraft for PC, AND and iOS is colorful and functional with simple animations. Portraits painted on the cards bear resemblance to the heroes known from Warcraft universe.